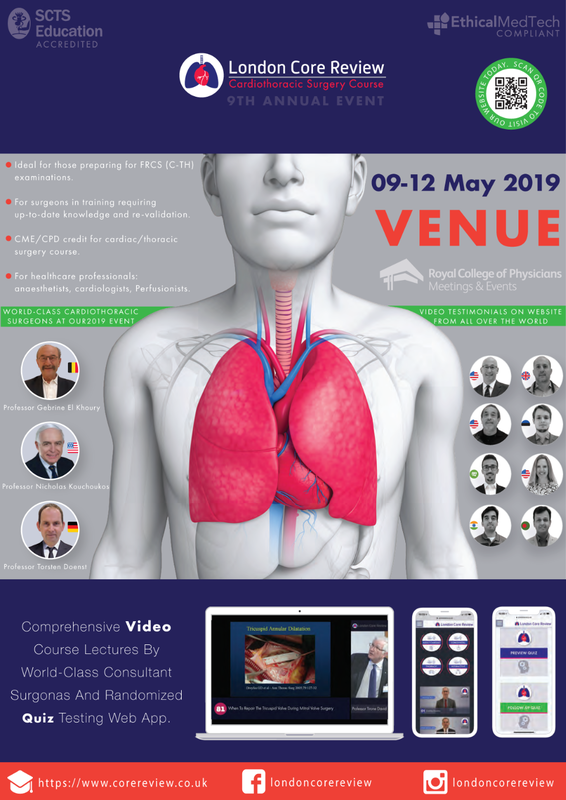 Our 9th annual London Core Review cardiothoracic surgery course event will be held at the Royal College Of Physicians in London between 9th-12th May 2019. Pioneering cardiothoracic surgeons lecturing at the event will include Professor Nicholas Kouchoukos, Professor Gebrine EL Khoury and Professor Torsten Doesnt. The 4 day cardiothoracic surgery course is suitable for: 1. Surgeons in training. 2. Those preparing for FRCS (C-Th) exams. 3. Consultant and attending surgeons for CME and CPD. 4. Revalidation process in Cardiothoracic Surgery. 5. Other professionals such as nurses and perfusionists. Registration for our event is now open at our website.